Discussion in 'JS Plugin Releases (RMMV)' started by Mr. Trivel, Oct 28, 2015. How to download the Plugin: Click the link above, there will be a button named Raw, press Right Click -> Save As. Don't remove the header or claim that you wrote this plugin. Credit Mr. Trivel if using this plugin in your project. Free for commercial and non-commercial projects. DaedraTalos, Queen, Fernyfer775 and 13 others like this. The description is wrong though..
"Adds color coding to items"
This might be awesome with a front row extension! Something like battlers at the back row will not participate in a fight or take damage, but if battlers in front row dies, the next member will replace the battler. It works great, though it doesn't work with Yanfly's Core Engine. When using your script in windows larger than the default size, the characters' battlers get too close to the enemy. Basically, they stay at their default position. Also, when using 7 characters at the same time, having the max chars per role setting on 4 instead of 3, will make 2 characters appear above each other. Could you maybe look into the compatibility thing? I'm sure it would be great to have your script working along with Yanfly's! Not this one. This plugin just sets character positions. Woops, that's from another plugin of mine. Fixed. Thanks for finding it. All fixed. - Now offsetting from the right side of the screen instead of left screen. Thank you for this!! now i can start on my project! 5+ battlers is essential to any rpg....i say the more the merrier! Working flawlessly now, thanks a lot! Great plugin, although the only thing that comes to mind when I see 9v1 is "ZERG!" This is great. Just one question - is there any way to fit all 5 members on the main menu? Does this also work for the front view battle system? Nope, that'd be a different plugin. Neat! Thanks, I was waiting for exactly this. 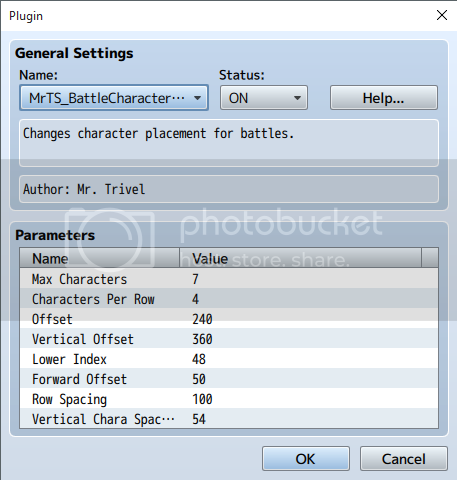 5 battlers was the minimum I wanted, your plugin allows to unlock more. I am extremely happy, thank you again. However, whatever I do, if I put your plugin next to YEP Battle Engine Core, 2 characters still appear above each others like JohnnyR told. Seems there is no easy way to get rid of this problem without modifying the .js file directly, but I am not yet comfortable enough with it. I fixed this by placing your plugin under it. So now I can have up to 8 characters and everything works fine, but not rows. They are all on the same row now, and I like the idea of having many rows. Any idea? Need more infos? Need my project file Mr. Trivel? Just PM or email me. Well, I can't say for sure this would solve your problem, specially since you're using 8 characters, but, try this setup. Also, if your battlers look to close to the border of the screen (if you're using a bigger resolution this might happen) just try to increase the offset value. Also, you said your rows aren't working correctly, but did you change the "characters per row" parameter on the plugin? YES! THIS is EXACTLY what I neeeeeeded for my game. You are truly Mr. T! This is a fantastic plug-in that just got me one huge step closer to the game I want to make. Many thanks! Can I set less party members with this script? I set "max members to 3" and still 4 appears in battle. Yes it works. Tested on empty project. Worked for me. Does it clash with another script maybe? Is it possible to set the maximum battle members to a variable, if you want to make one HUGE enemie, that can only be defeated by 7 chars, but for the rest of the game, you still have 4 battlers?